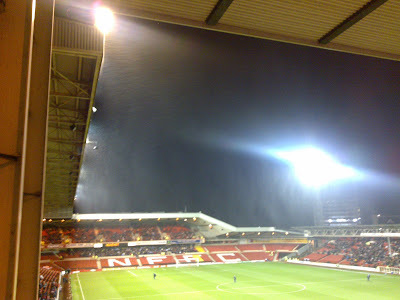 In some of the foulest weather I’ve ever attended a football match (I was getting wet half way up the Trent End UPPER Tier), Forest extended their good form and recorded a second consecutive win against a top six side aiming for promotion. We battled harder than Preston, we acclimatised ourselves to the conditions better and we created more chances. In short, disregarding the bizarre nature of the second goal, we deserved the win. The lad Osbourne played well, if a little bit lightweight, but he’ll not make it at Premier League level. McCleary is improving, Wes Morgan simply immense and Chris Cohen never stops running. Robbie Earnshaw is a red, is a red, is a red, etc etc, and he’s paid to score goals. Two goals in ninety minutes is a good night’s work, coupled with his ability to hold the ball up, he’s a class act. £2.6m = bargain. On the other hand, Kelvin Wilson is still a weak link, but consistently, he’s a weak link in whatever position he plays. You see, you need players like that, players who can perform to the same standard all over the pitch. Things are getting tight down at the bottom of the league, Southampton have suddenly decided to make a fist of it, and even Norwich have won a game, so a few more wins are needed, but I’m fairly certain we can stay up and that’s all that matters now. On a negative side, we’ve suddenly turned into a team of cheats, sorry, taken on board some “professionalism”. Time wasting is fairly common-place, but we’ve added to that by slinging two balls on the pitch at the same time. The players have been told to celebrate goals at the corner flags to waste a bit more time. And you can tell if a player’s about to be substituted because they suddenly pop up in a position half way across Lady Bay bridge, it’s a long walk back from there. I’m not sure I like it. Sure, it’s successful, and it don’t half wind up the opposition, but I was bought up in the Clough days, an era where Forest teams didn’t argue with referees, showed respect, frowned upon the antics of the Wimbledon’s and the John Becks of this world. It might be successful, but like the p**s they serve up behind the bar in the Trent End, it leaves a nasty taste in the mouth.